Your Friday prompt for Stream of Consciousness Saturday is: “brake/break.” Use one, use them both, but whatever you do, enjoy! 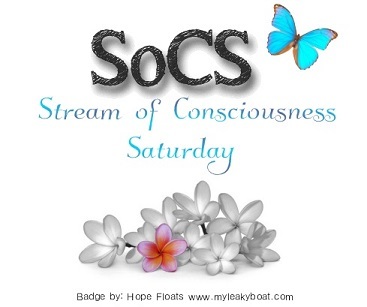 Nothing like posting a completed on Saturday SoC post at 5:30 am on Wednesday morning. I’m broke. I need a break. And a donut. This week I cheated — just published my scream of unconscious now. I haven’t got a time difference to blame. These days, if it’s done, and I don’t hit publish, well, it might sit as a draft until it catches a cold from the draft and needs a draft beer to . . . shut up, lol. I have a Friday song for you — I’ll post it in the comments for THIS week’s SoCS. If I can find where I put the YouTube url. Pingback: Stream of consciousness Sunday: The wrong stuff, part twenty six… | Diary of an Internet Nobody. Pingback: Taking a Break, Sort Of – Anything is Possible! Thanks for keeping at it even though you had a busy week. You are an inspiration to us all. Thank you, Jenny. 🙂 Can’t stop doing the prompts! Good day to you Linda and have a lovely weekend. This looks like so much fun. I’m going to be joining in next week.